The WaPo’s Howard Schneider posted two neat charts the other day that he thought kinda maybe suggested our economy is poised for a rebound. The first chart showed pent up demand for household formation. That’s good news for both the economy, since it should unleash more consumer demand, no to mention, of course, for parents longing to be empty nesters (like the old country song says, “How Can I Miss Ya If Ya Never Go Away?”). I found the second chart less convincing, and will, in a moment, discuss a new paper that amplifies my concerns. Schneider shows that household have paid off a lot of debt—they’ve deleveraged—such that their debt-to-income ratio is getting back to pre-housing bubble levels. He suggests this means they should be ready to consume and invest again. But deleveraging is, of course, expected after a bubble. In fact, we’ve been in a “Minsky Moment” ever since the bubble burst, where borrowers and especially lenders go from underpricing risk to overpricing it; from irrational, bubble-driven risk seeking to excessive risk aversion. What I’m looking for is trends like those in Schneider’s second figure to reverse course and begin to climb again. In fact, I doubt they’ll be much economic traction from the dynamics implied in his first figure—unleashing the new demand embedded in household formation—until we see trend reversal in his second figure. No, I’m not asking for everyone to start inflating the next bubble. 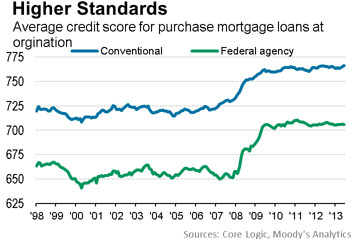 I’m simply recognizing, as do Jim Parrott and Mark Zandi in this new paper, that credit constraints still abound, particularly in the housing market. Easing lending standards to return credit scores to pre-bubble levels would boost home sales by around 450,000 units and new single-family home construction by around 275,000 units, according to estimates from Zandi. The increased construction and the benefit of higher home prices, he forecasts, would over time reduce the unemployment rate by 0.4 percentage points. When a lender makes a loan to be purchased or insured by one of these institutions, which together cover 85% of the purchase market, they do so with the understanding that they will not bear the cost of any subsequent default. However, the government retains the right to put the cost of a defaulting loan back on the lender if it is later determined that the lender did not follow the rules in making the loan. This allows Fannie, Freddie and the FHA to enforce their underwriting guidelines and thus better manage their risk. Nothing wrong—and a lot right—with that, of course. Bad underwriting was at the heart of the housing bubble and subsequent meltdown. But the problem is that current put-back guidelines lack clarity, so in order to avoid potential losses, banks will lend only to the most pristine borrowers. Some of the fixes are pretty obvious. The government guarantors can put back loans these days for “virtually any mistake, however small or unrelated to the borrower’s credit risk,” like a misspelling or a garbled copy of a page. Certainly, lenders and guarantor’s could agree on what constitutes a substantive problem versus a meaningless glitch. Tougher issues to resolve are judgment calls like deciding what’s an appropriate comparable property for an appraisal. Right now, if a home loan defaults and guarantor disagrees with the lender’s initial appraisal, that’s grounds for a put back. What we’re left with is an insurance system that’s too unreliable and thus too risky from the lenders’ perspective. So they’ve over-tightened their credit standards, or in the lingo of cool housing-finance types: shrunk the credit box. P&Z note, however, that a similar problem existed with the initially underutilized HARP program, a government program to help underwater homeowners with decent credit refinance their home loans. But lenders, housing policy makers, Fannie, Freddie, etc., got together and hammered out acceptable guidelines. It’s a good model for what needs to happen here as well. There’s a balance between bubbles and healthy credit markets, between risk aversion and risk mismanagement. Left to its own devices, the market hasn’t exactly been getting that right for a while now. It would thus be helpful for regulators to work with stakeholders to help find that balance in the market for housing finance. The sooner the better. Share the post "Opening Up the Credit Box"
3 comments in reply to "Opening Up the Credit Box"
1. I remember seeing not long ago that around half of the debt reduction was due to bankruptcies; how likely is it that many of these people would be eager to jump back into residential real estate even if the option presented itself? 2. Where’s the income to support these new mortgages supposed to come from? Are we really back to believing in “trickle down” again, because all of the income gains are going straight to the top? 3. There are probably a lot people out there now that understand that highly leveraged residential real estate is not a suitable investment for the 75+% of people without much net worth and any possibility of losing their jobs. 4. There’s been no real change in the predatory TBTF bank situation and people now understand that these corporations operate beyond the U.S. civil and criminal justice systems. Who (of the 80%) would knowingly put their life savings and future income at this kind of risk; and if they would, do we really need a better indicator that they may not fully understand the risks to their family’s financial well-being and security? There’s a reason stock brokers are limited to selling only suitable investments to non-professionals. Just who’s interest is it in that real estate brokers are exempt from these restrictions? I wonder how many of these newly formed households have friends and acquaintances that are deeply underwater as a result of this “investment” strategy and will be for many, many years (or have been force to file bankruptcy to get out from under the debt after a job loss). Perhaps we should start looking for studies on changing attitudes towards savings and consumption for these new households. After all, it is possible that many of these people could be learning other things from this crisis than what the financial industry would like them to be learning. It may not be back to “business as usual” with everyone “buying” in to this must buy a house and shackle yourself to a mortgage strategy. Why ignore the suffering of foreclosures and negative net worth despite increased sales? pain. Perhaps we could write some light forms of torture into measures necessary for those willing to accept physical punishment for debt, unemployment, financial naivete, in exchange for keeping their homes and partial debt relief. I left out the quotes, this is not my copy, but rather from the link given as the source, taken verbatim.